Home » Food & Nutrition » Blood Sugar Friendly Foods » Review – Low Carb Pizza from Real Good Pizza Co.
Review – Low Carb Pizza from Real Good Pizza Co.
Ahhh Pizza…. 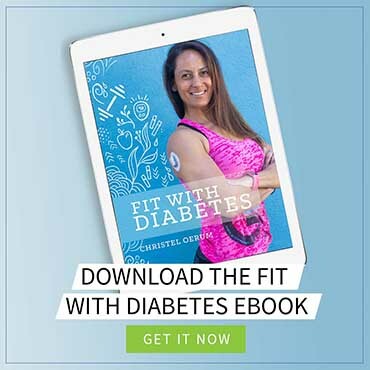 The nemesis of most people living with insulin-dependent diabetes. The cheesy, fatty deliciousness combined with bread and sauce is guaranteed to put you on a blood sugar roller coaster for the rest of the day and instantly expand your waistline (at least, that’s how it feels). But now there’s a new kid on the block, and that’s the Real Good Pizza Co. They claim that they can give you a gooey, cheesy pepperoni and meatball feast without the blood sugar rollercoaster because their pizzas only have 4 grams of carbs (and 25 grams of protein!). They also claim that their low carb pizza still tastes just as good as regular pizza! That sounded like a dream come true, so I had to do a Real Good Pizza review! Disclaimer: This is a sponsored post that contains affiliate links. All opinions in this post are my own and are based on my own tests of the product. How do you make a pizza with only 4 grams of carbs? Real Good Pizza Co’s trick is their low carb pizza crust made of chicken and parmesan cheese. I know that sounds all kinds of weird, but I promise you, it’s brilliant! The crust has the consistency of a very firm pizza crust and tastes great. Because the pizzas are completely grain free, they contain no gluten. They are also made with hormone and antibiotic-free chicken, all natural and non-GMO vegetables, and locally sourced cheeses, which I am a big fan of. The Real Good Pizza Co sent us a box of Pepperoni pizzas and a box of the Supreme pizzas (Italian sausage, pepperoni, and veggies) and both Tobias and I truly enjoyed both flavors. Just to show how little of an impact a Real Good Pizza had on my blood sugar, check out my 6-hour blood sugar graph below. 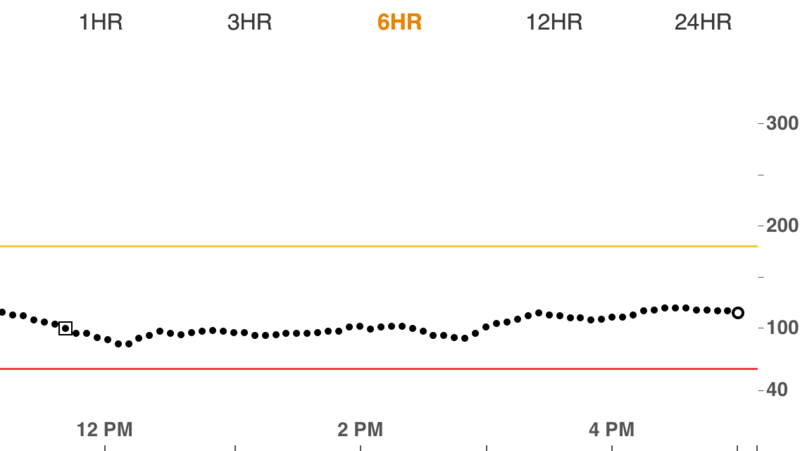 The little square indicated when I had the low carb pizza, accompanied by ½ iu NovoLog and 0.7 IOB, and what happened to my blood sugars for the next 5 hours — which was nothing! I had a small bump at 3 PM, but that’s mainly because I was hungry and had a small snack. If this had been a standard pizza, my sugars would most likely have climbed for hours after eating it, and I definitely wouldn’t have flatlined as I did. Is this the diet pizza we have been dreaming about? Well, no. 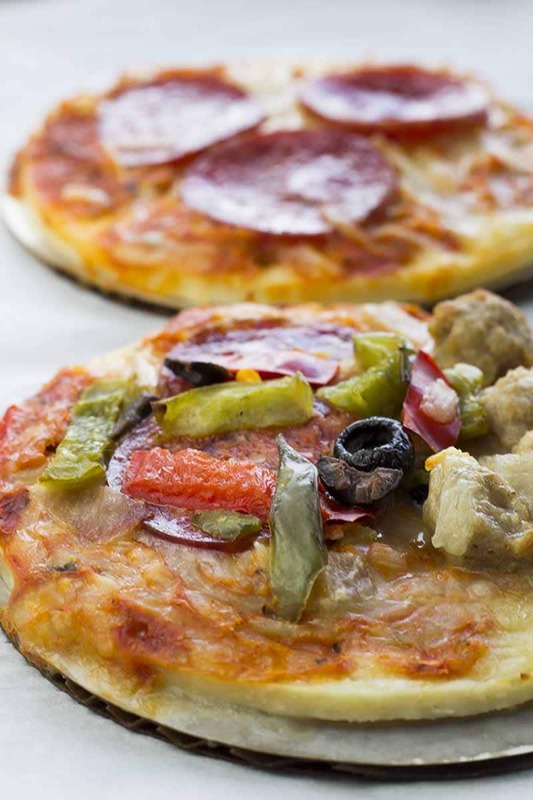 While the pizzas pack 25 g of protein and only 4 g of carbs, they do also have 14-16 g of fat and 240-270 calories. It’s not a huge pizza either (only 5 inches across), so to me, it’s more like a snack. But if you are in the mood for pizza and don’t want the nasty blood sugar impact or ton of calories, I think this is an excellent option. They are also FANTASTIC for people who want to increase their calorie intake with a healthy and tasty snack that has great macronutrients for muscle building. The pizzas are frozen when you get them and you can either heat them in the oven or in the microwave. While the microwave is the quick and easy solution, I found that they were much better when I took the time to heat them in the oven (isn’t this always the case?). You can get the Real Good Pizzas in more than 500 nutrition specialty stores nationwide (Vitamin Shoppe, Complete Nutrition, Hi-health, etc.) and they will be launching nationwide with Kroger on May 1. However, the easiest way by far is to buy them directly from their online store. If you use the promo code THEFITBLOG, you will get a 10% discount on your entire purchase. Shipping is free to all the 48 continental US states. So, do I recommend them? Absolutely! I will definitely have a case of these low carb pizzas in my freezer for when I get the pizza munchies! How can you not love a pizza with only 4 grams of carbs that tastes like a real, delicious pizza? 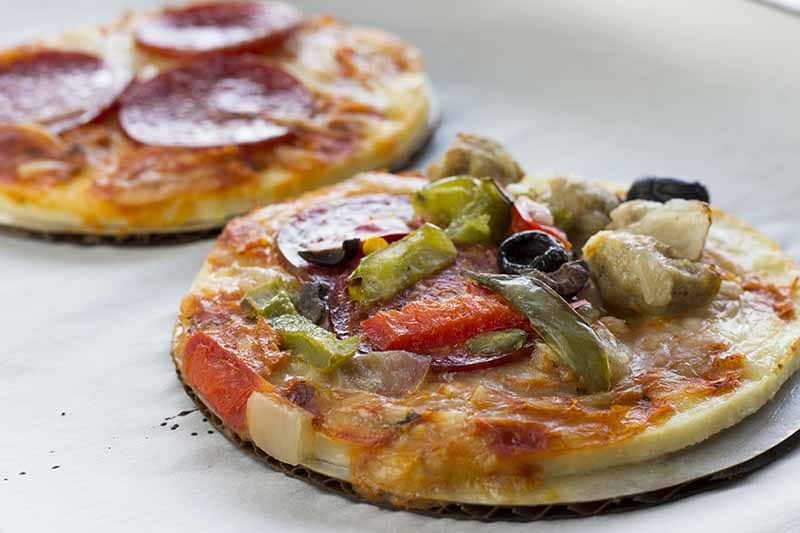 Buy these low carb pizzas here and use the code THEFITBLOG to get 10% off your purchase! The taste was good, but mine exuded a lot of water in the oven. The first time I didn’t read the directions carefully (if all else fails, …) and I put it on a perforated pizza pan – what a smoking mess! But still, pretty convenient, and this time I’m using foil underneath! Too bad you didn’t enjoy it. I’ve truly enjoyed all the ones I’ve eaten, but we’ll of course not all have the same taste. Glad you didn’t buy a whole years supply. I bought one yesterday, it was FABULOUS!! Perfect for someone doing KETO.. I want to know about the amount of sodium and sugar in them? It depends on the type of pizza. The pepperoni pizza has 2 grams of sugar and 990 mg sodium. The Three Cheese has 2 Sugar and 800 Sodium. Also, each pizza is two servings. So if you eat the whole thing, you’ll need to double those. I’m not diabetic, but I try to avoid sugar/carbs, so these are a good choice for me. It’s pretty tasty with pizza flavor, but it’s definitely different texture-wise. I figure it’s a trade-off: 50 grams of protein and hardly any carbs, I can do that. I’ll for sure keep them in the freezer, but I’ll probably splurge on real pizza every once in a while. A great read for the day and my craving for pizza is definitely increased now. Will surely like to try it with my little experiment of changing electric oven to wood fired pizza oven. Thanks for posting this healthy pizza tour. I had to try this pizza. I googled the store locations and went to the Vitamin Shoppe and purchased one. So bad news first– the are very small. I figured it would be tiny– but it was a little smaller than a black and white cookie . Lol. Good news? It was DELISH!! And very satisfying. I ate this with a nice big salad and I was very happy! These are pizzas that I would like to keep in my freezer! Going to buy in bulk because at 6.99 a pop at the vitamin shoppe– you can go broke! Wow!! Am definitely going to try an expirament w these myself!! Love that they didn’t effect ur BG at all!!! Thanks for the link & the 10% off!! Right! 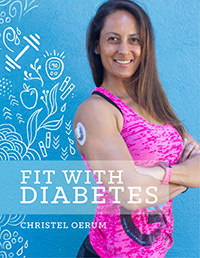 I had a little (healthy) skepticism going on which is why I chose to do the Dexcom documentation. Will be ordering on payday as well. I am not only diabetic but gluten sensitive as well. Thank u thank u for posting this! Does the company offer samples? I am interested in tthem but don’t want to spend $70 + and not be happy with them. These are pretty good. I love supreme pizza. They could use a bit more cheese. Otherwise you don’t really miss the crust and they taste great. My cheat is to sprinkle a little extra mozz on them and villa! Thanks for the info. Ordering a case payday to try it!